The Friends app enables users to stay in close touch with up to a dozen friends or contacts. You use the Friends screen in the Apple Watch app on iPhone to choose friends and their order of appearance. Then you can quickly navigate the Friends app and display the screen for the friend you want to contact. You can place a call to the friend, send him or her an instant message or communicate via Digital Touch if your friend also has Apple Watch. When the watch face appears, click the side button. When you see the Friends screen, you’ll see the last friend with whom you communicated, as the app automatically select that friend. The friend’s name appears at the top of the screen. The friends picture or initials appear in the center circle. Turn the Digital Crown. The selection will move around the circle in the direction you turn the Digital Crown. Note that you can also tap a friend instead of turning the Digital Crown. After you selected a friend with whom you want to communicate, pause for a moment, and the friend’s contact screen will appear. Now you can tap Call to place a call. You can tap Digital Touch to communicate via Digital Touch, if your friend has Apple Watch. You also can tap Message to send an instant message to your friend. Note that the Friends screen always displays the appropriate screen for the icon you tap. To give an example, when you tap Call, the app enables you to choose which phone number to use. Fantastical 2: Apple’s Calendar app is fine for reading appointments, but Fantastical 2 saves you fishing out your iPhone to add events. Force Touch to access the relevant command, and then dictate. The app’s natural-language input means it usually successfully interprets the likes of “lunch on Friday at 2 pm for an hour”, making you feel like you’re living in the future. Streets for Street View: If nothing else, Streets 3 feels like a glimpse into the future, when Google’s own maps app is a bit more capable on Apple Watch. With Streets 3, you search for a location, grab a favorite flagged on the iPhone app, or trawl through a ‘gallery’ of interesting and famous places. Confirm a selection and you’re presented with a panoramic view to explore by twiddling the Digital Crown or moving your wrist. An amusing toy for your wrist-based Apple companion. Onefootball: So there you are in the world’s longest and most pointless business meeting, or an endless dinner with the in-laws, with no idea about the progress of your team’s valiant cup campaign. Onefootball enables you to track teams and have live scores sent to your wrist. Just don’t emit a huge cheer or cry of anguish after sneaking a crafty look at the display. Hole 19: A comprehensive tool for golfers, Hole19 provides you with hole routing, course stats, and a simple interface for logging your score. Once you’ve started a round on your iPhone, your Apple Watch hones the data down to what you need at any given moment: key distances; score input; and putt tracking. Clicker: Ambition’s all very well, but sometimes it’s the simpler apps that grab hold – and Clicker is certainly very simple. Post launch, you tap to increment a number on the screen. Force Touch and you can subtract or start from scratch. That’s it. Complication support leaves your number front and center, so you can keep tabs on group numbers, days since an event, or exercise laps – at least up until the maximum supported number (2,147,483,647 – which is a lot of laps). Tally 2: If Clicker doesn’t really do it for you, on the basis of your life being a bit too complicated to only have a single counter on the go, try Tally 2. This app enables you to create and name multiple tallies, which increment with a tap. Force Touch and you gain access to additional features (rename; reset; downwards counts). For free, you get two counters; pay the one-off IAP and you can have as many as you like. TodoMovies: If you’re a big fan of movies, you’ll want to keep track of great-looking films to check out and what you’ve already seen. TodoMovies ably deals with both, also enabling you to rate what you’ve watched. On iPhone, you get trailers, a comprehensive movie database to search, and themed lists to peruse. On Apple Watch, you just get access to your lists: Watched, To Watch and any custom lists you’ve created; but these lists can be quickly explored and reordered, and you can move and rate items. Shazam: There’s still that sense of living in the future when it comes to Shazam. Waggle your phone about while a song plays in the background, and the app will reveal what it is. Now, you don’t even have to get your phone out – just wave your arm around to reveal a song’s title, as well as lyrics, just in case you want to leap on to the table and wow your friends with your vocal prowess. (Source: The Best Apple Watch Apps). 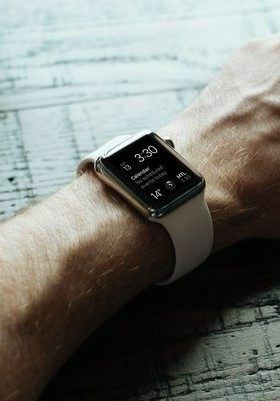 We are just eager to buy your used Apple Watch from you if you feel like exploring next generation Apple Watchs and pool money for them: Sell my Apple Watch for top dollar. Video published by WatchGadgetHacks on April 29, 2015.